1. Only 3 districts are disturbed in nature, that constitutes 5 percentage of the Land mass of J&K, the number of terrorist being around 300-400, and all stone pelters are Paid workers which is now being open proven case from the Pakistan supported by the ISI, could you compare it with Chechnya. And don't know how the Russians reacts with the opposition, but here the Indian security forces are only answering them with this weapon. The reason they could show off in open, with face covered and with the ISIS and Pakistani flags. 2. Geographically, devide the J&K into 3. 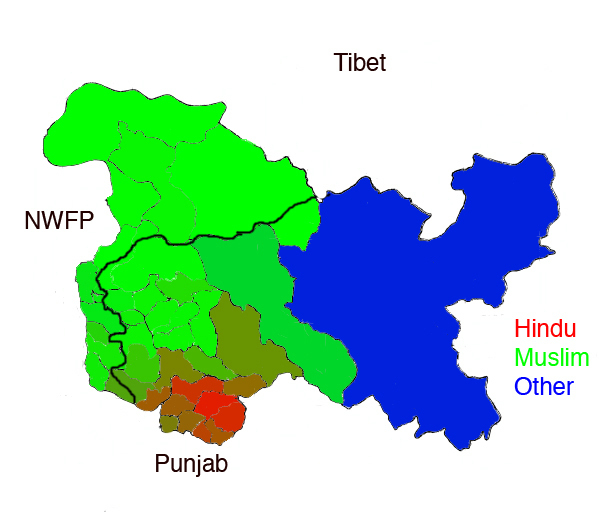 First is the Jammu Region -- Majority Hindus, Kashmir region -- Majority Muslims, Ladhakh region -- Majority Buddhists. 3. Economically, the main source of income in the Kashmir region was Tourism, which flourished in 80s, the same, which was targeted to keep the tourists away, thus cutting the main source of income, and making them Jobless, so they could join the terrorism industry run by the State terrorism department of Pakistan, which diverted the funds pumped by the USA, for the raising the Mujahideen Brigade against Soviets in Afghanistan. 4. This state is the highest funded State of the country, and its local leaders have been take a good chunk of money, even the Separatist Leaders are paid well by GOI and enjoing all previledges including security, 5 Star Hotel, and freedom to do anything even spilling poison against the India in rallies, but what happens, now is that GOI is start considering, since they are more interested in a dialogue with the Pakistan rather than India itself. 5. Our Media, and some particular news channels, and the democractic system of opposition to make some browny points, remarks, are doing harm to our country by projecting that some big movement of so called Separatism Movement is going in the Kashmir, by comparing the deaths forgetting several times death is due to the Road accidents in New Delhi and its NCR region. Before making any image and impression ask, someone who had been their and had good idea of the state, such as @Hellfire and all the legality related to the State, rest you are free to use the Google Service. YarS and TrueGR!T like this. Very little. As I can understand, that he don't want to play chess and he can't play chess. May be, I'm wrong. old driver and Angel Eyes like this. Thank you, @zebra7 ! And what about Aksai Chin? Do you pretend on it? China thought it would have Russian support in the Doklam conflict as it had on other fronts like North Korea and East China Sea but they were wrong and forgot India is Russia's good friend. Ha! Ha! Ha! The laugh is on China. Economic development has been slow due to bad security situation. India has fought wars with both Pakistan and China over Kashmir. So its a serious matter. The religious parallel between Chechnya and Kashmir only apply to the Muslim areas of Kashmir. Most of Kashmir is not muslim. See the map - Kashmir is at the topmost tip of India. Anish and YarS like this. War between North Korea and US and possibly involving China is imminent. China will pay the ultimate price for it. My point is, the Indian republic was most vulnerable right after the fall of the soviet Union, cuz you know our foreign reserves went kaput and the Soviet Ruble turned into rubble, we didn't even get the new Russian Ruble, Instead we ordered truck loads of Su30MKIs and T90s from Russia, That like being poor still giving half of your bread away to a friend. The Russian MIC were only serving Indian orders for good 5-7 years and that literally saved the MIC of Russia. So we were Quite resilient then and we are quite resilient now. Conclusion being the republic goes stronger by the day and for a noisy democracy it is quite remarkable. Wish good upon a friend and and you'll have good karma. (We are Hindus, we literally invented Karma). Good day, my friend Slava. Hey I sorry I didn't use English,because that Indian use Chinese,I think maybe he can understand.i am trying to say that why I don't wanna play the chess mean all Chinese are fool?